James Pringle Cook is a Kansas native who studied Emporia State and Wichita State Universities. 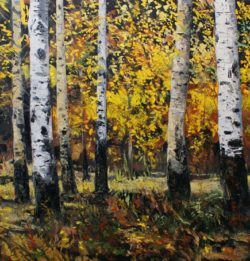 After moving to Arizona to teach, he later began working there full-time as a landscape artist. Cook uses the textured, gestural lines of mid-century Abstract painting to create lush images of the shadows, light, and movement of the various landscapes he explores. Not content with only the traditional subjects of Southwestern landscape, his work finds the monumental beauty in trees, water, urban buildings, and industrial complexes. Cook spends part of each year in the Flint Hills of Eskridge, Kansas, where he uses his family’s old hardware store as a studio space. The public is invited to an Opening Reception on Friday, January 20th, 2017 from 4-7 pm. There is no charge to attend the Opening. Due to weather, the Opening will be moved to Friday, January 20th.